This morning we left Sunyani for Accra to visit and work in the largest hospital in all of Ghana. After landing in Accra we immediately boarded the bus and headed straight to the only mall in Ghana to refresh our snack supply. 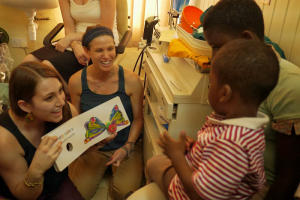 We headed to Korle Bu Teaching Hospital to provide speech and language therapy to both adults and children. Upon arrival, we were introduced to the famous Albert, one of 9 speech language therapists in Ghana. We also met Clement and Josephine, two SLTs who are starting the first masters program for SLT at the University of Ghana. We split up into three groups of five students and began providing therapy. We were all nervous, but excited to begin applying our knowledge and thinking on our feet. We saw a variety of patients with varying disorders such as autism, Down syndrome, aphasia, cerebral palsy, and speech disorders. Each student was given a different role during the evaluation and we all worked together to create functional goals and techniques that would benefit each patient. We taught these techniques to the patients and caregivers so they could practice at home. Providing therapy today was a challenging but rewarding experience! We are beginning to realize how much we have already grown and will continue to grow as clinicians throughout this trip. After leaving the hospital we had an amazing Ghanaian meal at our hotel. We all ate many helpings of chicken, fish, plantains, pasta with steamed veggies, rice and beans, and watermelon. It was delicious! We also met to discuss all the patients seen, their progress, and what lies in store for us tomorrow.